You’re here because either you or your partner is jealous and this jealousy is painful enough in your relationship and life that you’re finally ready to do something about it. 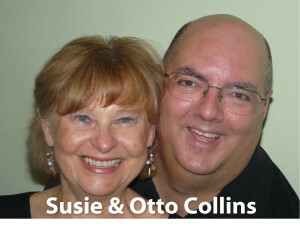 We’re relationship coaches Susie and Otto Collins and you may not know us yet, but we’re experts on helping people like you overcome jealousy before it ruins your relationship and life. We created this website because we want to help you get rid of the jealousy that’s causing so much pain, misery and uncertainty between you and the most important person in your life. In order to best help you do that, we’d like to ask you a few questions about jealousy and your relationship. These questions and your answers are for your eyes ONLY as a tool for discovering just how BIG the jealousy problem is for you in your relationship and what your next steps are for overcoming it. 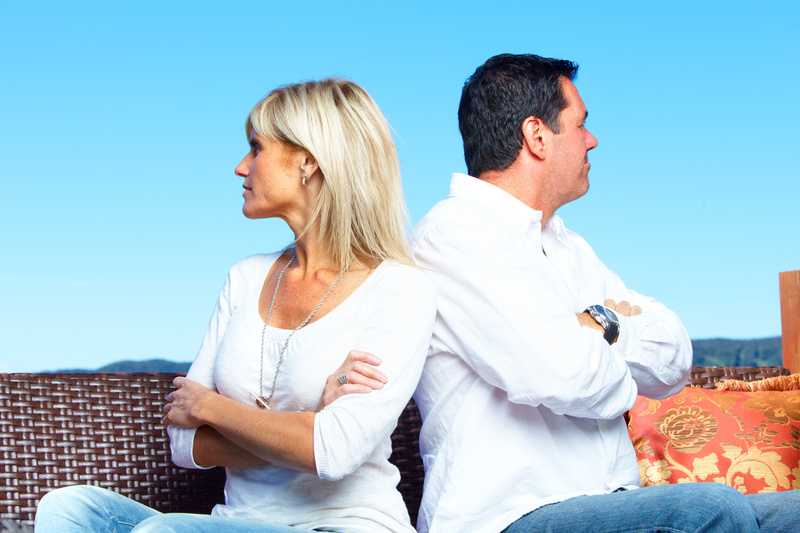 Have you ever accused your partner being with someone else–even if they adamantly deny it? Have you ever lost a relationship in the past because of jealousy? Are you insecure, suspicious or not trusting of your partner or spouse? Have you ever wondered whether this jealousy and lack of trust is truly justified or not? Have you ever checked up on your partner by looking through their cell phone, computer, email, purse, briefcase etc. to see who they may be communicating with that you don’t know about? Have you ever accused your partner of dressing too provocatively or too nice for the occasion? Have you ever accused your partner of “flirting” or being too friendly with someone else? Has your partner ever suggested they might consider leaving the relationship because of your jealousy? Do you ever call your partner when you’re feeling anxious just to make sure they’re not with someone else or doing something they shouldn’t be doing? Do you ever feel that your partner is looking at and paying too much attention to other attractive people when you go out? Have you or your partner ever lied about where you were, who you were with or what you had been doing to prevent another fight or argument? Do you find that you’re still angry or upset about being cheated on either in this relationship or one in your past? Have you ever thought that because of your jealousy, you might actually be going a little crazy? Have you ever wished you could talk to your partner about your feelings without them blowing up and getting upset? The “green-eyed monster” called jealousy can and will destroy your relationship or marriage if you don’t do something to stop it in its tracks. There IS a way to eliminate the shame, insecurity, and self- doubt. You CAN overcome the jealousy, get your life back and enjoy the healthy relationships you deserve…And it’s easier than you think! In the early days of our relationship–long before we were highly successful Breakthrough Relationship Coaches–we had our own struggles with jealousy. We’ve been there, maybe exactly where you are right now. In fact, things got so bad, we didn’t think our relationship would survive. It tore us apart– made us question ourselves, we felt unloved and it caused a great deal of unnecessary turmoil. We would be out at a restaurant, a social gathering, a party or a get-together at a friend’s house and Susie would see Otto talking to someone else–especially another beautiful woman–and her whole body would start to tense up, her heart would start beating faster (and not in a good way), her mind would start racing and then she’d start seeing and imagining the worst possible scenarios in her mind. It wasn’t that Susie didn’t trust Otto. It’s just that these jealous thoughts were like scenes from a bad movie that she couldn’t get out of her mind and the worst part is that they would seemingly come out of nowhere and just “blind” her to the point that this was all she could think about and focus on. Her jealous thoughts were enough to drive any sane person crazy. You name it and she thought it– and as we just said a moment ago–it very well could have totally ruined our love and relationship. Jealousy was so intense that neither one of us could really be who we were and this was awful. Otto was always trying to reign himself in and not really be his normal, outgoing self when we would go out. He didn’t feel like he could talk to as many people as he would like in social situations out of fear of how Susie might react. Because of the tension that the jealousy created for the two of us, we also weren’t nearly as connected as we would have liked and our intimacy suffered. We found a solution for these painful, agonizing feelings! We discovered the exact steps to take to save our relationship and remove the JEALOUSY out of our lives forever. And you can too! Now, at parties, get-togethers with friends or social gatherings, Otto is the one coming to find Susie — wanting to be with her, and she’s able to have a perfectly fine time NOT watching what he’s doing or keeping tabs on him. We’re two people (like you) who’ve lived through this. We struggled with the apprehension, heart-break and uncertainty in our relationship. Our relationship used to be filled with jealousy and now we have a close, connected and incredibly passionate relationship that we wouldn’t trade for anything. We ended our miserable nightmare and so can you. Since you’re reading this, we believe you’re already much smarter than most people and ready to get rid of the unhappiness in your life. Many people would have already clicked off this site. You were meant to have a life FREE Of JEALOUSY! Maybe your partner has given you plenty of reasons to cause you to doubt their love, honesty, faithfulness and desire to be with you–and maybe they haven’t. Maybe you’ve been in other relationships where you’ve had a partner or spouse who’s lied to you or cheated on you. Maybe you’ve seen firsthand relationships (maybe your parents) or marriages of people you know, love and care about be totally destroyed because of lies, cheating or an affair or infidelity. If you want to know why being jealous is such a huge issue in relationship today, you don’t have to look any further than your favorite media outlet. We are all being constantly bombarded in movies, television, books, magazines, newspapers, emails, music, and on the internet with the message that everyone lies and cheats–especially in committed relationships and marriages. The airwaves and other media outlets are filled with real and made- up stories of infidelity and betrayal. If you hear enough of those media messages over and over (and ALL of us have), it’s only natural that you’re going to start putting a question mark in front of everything your partner says or does. Because of all of these messages (plus maybe what happened in your past), it’s no wonder you have all these jealous thoughts that you can’t seem control! What if your jealous thoughts AREN’T true? If you know that your jealous thoughts aren’t true but you see yourself being cheated on or your partner leaving you anyway, know that this way of thinking is a habit and give yourself the choice of not believing all the thoughts you are thinking. Believe it or not, you can break this habit of thinking and quicker than you ever thought possible. What if your jealous thoughts ARE true and cheating is really going on? If you know there is truth to your suspicions, we still advise you to not believe all your fearful thinking about the situation because the answer cannot come from those thoughts but only from clear thinking. When you allow your mind to clear, you’ll be able to become aware of the next step you need to take in an empowered way instead of continuing your jealous cycle that keeps you stuck. 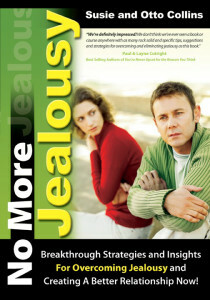 What can you do to STOP Jealousy and Jealous Thoughts in your relationship and life? We’ve created a breakthrough program that shows you exactly how to stop the insanity that jealousy creates in your relationship and life. The breakthrough program created specifically to help you stop your jealousy and create the relationship you want RIGHT NOW! “No More Jealousy” is an amazing program that will help you start dissolving those jealous thoughts, feelings and out-of-control irrational relationship killing behaviors–almost immediately. “No More Jealousy” is more than just a book or an ebook. It is a complete “soup-to-nuts” program for overcoming jealousy and restoring your relationship, as well as your sanity. The “No More Jealousy” program includes a book and 6 audio recordings, as well as a special report on how to get free from jealousy in your close relationships, all tightly focused on helping you heal this painful situation you’re living with and create a love relationship that’s exactly what you want–free of the pain of jealousy. What’s great about this program is that it’s available in your choice of either an instantly downloadable format or you can have the program sent to your home or office anywhere in the world in an unmarked package. You can start learning these incredible secrets and strategies for overcoming jealousy almost immediately after you let us know you want the program. ~ Get both the printed paperback version that is sent to you by mail AND the instantly downloadable version. We’ve organized this “No More Jealousy” guidebook from our program into two parts. In Part 1… We introduce you to some new ways of looking at jealousy, help you understand what it really is, where it comes from and give you dozens of concrete ideas and strategies for letting those jealous feeling melt away like butter on a hot summer day. After you’ve finished with this section of the book, you (and your partner) will know exactly what to do in tense, crisis- filled situations where jealousy has come up quickly or seemingly exploded out of no where and you need to know what to do and how to handle it. Woven within the pages of this “No More Jealousy” guidebook are our personal stories, along with the questions and stories of others who gave us permission to use their words with the hope that their experiences would be helpful to you as you discover how to stop your jealousy and restore your relationship or marriage. There are questions at the end of each chapter to help you examine your specific situation more closely and to give you more clarity about your situation and what you need to do in order to break free of the jealousy when it comes up. Get both the audio CD version that is sent to you by mail AND the instantly downloadable version (for one low price). These 6 audios are NOT Susie and Otto reading the “No More Jealousy” guidebook. These recordings are 40-75 minutes each and offer additional insights, breakthrough strategies and coaching specifically designed to help you solve this jealousy issue in your relationship and life. On this recording, we (Susie and Otto) are interviewed on jealousy–why it’s a problem, how to overcome it, how to keep it from coming up in the first place. In this audio recording we show you what jealousy is and what it isn’t so you can recognize and stop it when it comes up.You’ll learn about the “two types of jealousy problems” and how to make sure neither one of them destroys your relationship. We introduce you to “7 Myths of Jealousy” and show you how any one of these 7 myths are so potent that they can destroy your relationship or marriage (if you buy into them.) Plus–on this audio…we give you the “first step to healing” and we take you through a a powerful exercise that helps you to get in contact with what’s really going on inside of you–so you can let go of it without causing you any more pain. In this audio, we help you deal with issues around control and healing past emotional wounds that keep stinging you with pain and stuck in jealousy. You’ll learn a powerful 4-question process for separating out what is true from what is not true about your jealousy, your fears and what your partner may or may not be doing. When you’re able to do this the jealousy simply loses it hold on you and lets go.You’ll discover a simple, easy-to-use stress management tool you can use anytime anywhere when you may be faced with a difficult situation or you are not at your best so you can “take care” of yourself in stressful moments and situations. On this audio, we give you the ideas and tools that we’ve used to create the relationship that we want so you can try them out in your relationship. We tell you how you can build trust with partnerships, how you can create agreements for how the two of you are going to be together, ideas for how to speak your truth to your partner and the secrets to listening and being understood. This is the 1st of two audios for the person who is with a jealous partner… Here we give practical suggestions for how to cope when you are the target of jealousy. In this audio recording, we give you a totally new perspective about what it means to be with a jealous person and give you very useful and practical ways for you to sort out what’s really going on. We also show you how to not only get to the place where you have more understanding for your partners fears, doubts and concerns but also how you can be more honest with your partner about their jealousy and do it in a way that helps them to be less fearful. This is the 2nd of two audios for the person who is with a jealous partner… Here we give practical suggestions for how to cope when you are the target of jealousy. In this audio recording, we give you communication and trust-building techniques for healing your relationship with your jealous partner. If you said “YES” to any of the above statements–then jealousy and lack of trust are definitely issues for you. We urge you to say “YES” to you so you can feel safe and comfortable even in social situations that have driven you crazy in the past. Life is too short to be miserable for one moment longer. All you have to do is be willing to invest a little bit of time, effort and energy into learning and practicing some new ideas and some new skills of self discovery and the rest is easy. What makes this “No More Jealousy” program so much more effective than anything else that’s available for getting rid of jealousy? There are plenty of resources out there including therapists, coaches, counselors, ministers, priests, rabbis etc. who are trying to offer relationship help to people who need it and we think that’s great. But almost none of them are focusing on the issue of jealousy. We don’t know whether the issue of jealousy is just too painful to deal with, it’s too messy of a subject or people just just don’t get the training in it to help others. We’re two of the select few people in the world who specialize in helping people like you overcome jealousy. It’s also a fact that some of the best trained therapists in the world regularly refer their therapy clients to our “No More Jealousy” program and to work with us on this issue. We know how to help you solve this problem of jealousy because not only have we done it in our own lives but we’ve been studying this subject for over 9 years now and after spending thousands of hours (and a lot of money attending trainings and conferences) dissecting the issue of jealousy and relationships–now we’re considered to be experts on the subject. And we want to help you stop your pain just as we stopped ours. Do you want jealousy, fear and doubt to rule your relationship and life? Do you want to put an end to your jealousy nightmare right now? If you’ve read this far, we’re thinking that you’re someone who really wants a whole lot more from your relationship than you have right now and you’re willing to be open to some new ideas to create something better. You’ve got no need to apologize for wanting a better life! There’s absolutely no reason to be shy about going for what you want. Contrary to what the world wants you to believe, satisfying your desires is not selfish. You were born to be satisfied…not settling for a trampled-down version of existence heaped with feelings of disappointment. Order the “No More Jealousy” program now and start going through the information right away. This program is the most complete course available anywhere on how to stop jealousy. Nothing has been held back. This program gives you everything you need to stop your jealous behavior now before it sabotages your relationship completely and you lose your partner and the love you really want. What Happens If You Don’t Get Your Copy of “No More Jealousy”? If you don’t buy this program right now, nothing will change. If you don’t get your copy of this program now, you’ll still be jealous. You’ll still feel those waves of doubt about your partner AND you’ll still be constantly wondering what they’re doing, who they’re talking to and whether you’re about to lose them to someone else. It’s also highly likely that if you don’t get control of your jealousy, YOU WILL lose your partner. After all, no matter how much someone cares about you or loves you–there’s only so much a person can take. Who would want to put up with all the constant drama, fighting, false accusations, defending themselves and worrying all the time about whether the next thing they say or do is going to put you over the edge again. If you don’t get this jealousy problem handled right now it’s just going to keep coming up over and over until you do. To make this an easy decision, we’ve priced “No More Jealousy” so affordable that you’ll be able to fit this into your budget with no problems. You can order the complete “No More Jealousy” guidebook and audio program for only $47. These are the recordings of a live 90-minute teleseminar we conducted where we gave our answers to the 12 biggest, most important and most pressing questions that our web site visitors and newsletter subscribers like you had about how to create closer and more loving relationships. These 12 questions are ones we hand picked from over 795 responses to a survey at our website. Of course, one of the 12 questions is about “how to overcome jealousy.” These recordings currently sell for $34.95. We’ve included them here as a free digital bonus for buying this package. “Love Lessons” is a 56-page downloadable ebook that will give you dozens of powerful insights, tips, ideas and strategies for creating an outstanding relationship. This book is a distillation of many of the things that helped us to create the blissful relationship that we now enjoy. This e-book was originally a book that was a part of our “relationship toolkit.” Our relationship toolkit is now no longer available at any price. The value of this book would be $19.95 if it was available. This is a 20-page downloadable special report that we created after we were asked to do a presentation on the 7 things we considered to be most important in creating an outstanding relationship. Of course there are more than 7 things that go into making a great relationship. But, if you’re going to limit yourself to only 7 Keys–these would be a wonderful foundation to forming any relationship. The value of this special report is $7. Your satisfaction is assured through our no risk, you-can’t-lose, 100%, no-questions-asked, money-back guarantee. If for any reason, you aren’t completely satisfied with your purchase, just let us know within 60 days and we’ll refund 100% of your purchase price. One of the reasons we offer such a powerful guarantee is–almost no one returns the program. It works. Click the add to cart button above to order “No More Jealousy” and you’ll be on your way to stopping jealousy and creating the relationship you’ve always wanted. P.S. Remember, this “No More Jealousy” package is not available in stores anywhere. It’s only available here. Don’t put it off. Order now and you’ll be taking that all-important first step toward attracting and creating the love you really want right now. I thought I was going “crazy”, which was the worst part… and the jealousy alienated my husband. He clammed up and stopped telling me certain things or would lie and change “Brenda” to “Bob” in his stories so I wouldn’t be jealous. My friendly, talkative husband was turned into a careful, less talkative man, which is tragic. The lingering results have been a less intimate marriage, which is the opposite of what I desire and consequently spurs more jealous thoughts. Jealousy not only effected my relationship it consumed my entire life. I would make my partner crazy from my incisive nagging and I made myself crazy from the constant ideas that I wasn’t good enough. I felt like my partner was gong to leave me one day because it happend before. I was desperate and willing to try anything to make the constant wondering go away in my head. I bought the NO MORE JEALOUSY packet and began reading and listening. I found that the most help came from the chapter that said that we tell our self stories that are untrue. We need to change those stories to the positive. So true, if I’m running around in fear that my partner will cheat does it matter that he’s not? In my head he is and it was making me crazy. I was ready to do whatever it took to change these patterns. So I changed these stories. There were techniques to identify feelings of anger and fear, and how to come to terms with those feelings. I have to admit that not every day is perfect, I have to remind myself of these tools often. I even have a bad day now and again and might take things out on people that don’t deserve it but I have the tools now to deal with these issues quicker and with more tact. I feel that this just wasn’t a book and audios, it was life lessons on how to deal with your feelings, and get out of negative patterns or stories that we tell ourselves. May I say that you have saved my relationship, I used to make false accusations, be jealous and get angry, though I would not know why, but listening to everything you two have said in your audio courses, I finally understand jealousy and why I am reacting like this. I have not finished reading the book or the audio courses, but my relationship is already improving. Thank you so much.I am so grateful to you two, if it wasn’t for you, I wouldn’t know how to control my emotions. And our relationship would’ve definitely ended, which would be terrible since we love each other so much.